If a product is not up to your satisfaction, please let us know within 30 days. We would love the opportunity to make it better by offering an exchange. Please send the product back to the address on the invoice, with a copy of your invoice and notate on there what you would like to exchange the product for. If you’ve receive a damaged product, we are more than happy to send you a replacement, just email us. At Poofy Organics, we try to do our best to keep our shipping prices low. We charge according to weight and zip code of the package. The great news is that we cap shipping at $24.95 so the more you order, the more you will save. In some cases, we will ship First Class Mail. If packages become too heavy, Priority Mail will be used. We are not able to offer Flat-Rate Box rates at this time as the USPS software does not utilize this capability. We use the overage for handling fees for our supplies and workers. Your shipping costs also cover exchanges. As a small business, we are NOT able to offer free shipping. Yes, we will admit that some companies can offer "free" shipping; however those companies' markups are substantial and/or are rolling their shipping fees into their retail prices. As a small business, we like to keep our products affordable and can only do so by charging shipping. We appreciate every purchase made! Q: I paid for Priority and my package is still not here, what do I do? As stated at our checkout, unfortunately, USPS does not guarantee shipping times. So while we will do our best to ship it via the shipping you chose within our 72 hour shipment time frame, there is always the possibility that USPS may not deliver within their time frame. All times are estimated and USPS requests up to twelve business days to deliver your package. In addition, if you ordered during a sale or right after, we may need a bit more time to process your order. As all products are handmade in small batches, it may take us time to catch up! Q: It looks like my package is sitting at a post office station, what do I do? Currently USPS does not scan at every destination. Not to worry though, your package is definitely still on the way! Q: Isn't non-toxic and toxic free the same thing? No. Non-toxic means the petroleum chemicals has been buffered with other chemicals to make a gentler product. These types of products still contain petroleum-based chemicals. Toxin-free products use simple, natural ingredients. The thickness and texture will probably be different and sometimes there are slight variations batch to batch. Soaps (not detergents) have no sulfates so lather will be less, but the cleaning power is superb. Q: How quickly will I receive my products? We do our best to create your product the day you order it. Because all of our products are fresh, we cannot overstock our items. At times, we may become backed up and it will require a few days to catch up. If you should have any questions regarding your order status, please feel free to contact us. Email is best. Q: Why do your products come with an expiration date? Because our products are created by nature, not by chemists, it may look and feel differently than other personal care products you may be used to. For example, your lotion comes with an expiration date. You will prolong the lotion's life if you keep it out of warm, damp places such as bathrooms. Storing it in the refrigerator will lengthen the life of the lotion as well. Q: Why are you using shipping peanuts? Aren't they bad for the environment? We are very conscious about the environment. Your home is our home as well! Traditionally, packing peanuts do not biodegrade. However, we only use two different kinds of peanuts. Either we recycle ones that we have received in packages or we use ones made from cornstarch. This type decomposes in water leaving no toxic waste. The peanuts are static-free and made from organic starch. How great is that! Unfortunately, because of high shipping rates and the exchange rate, we only ship within the United States; however, that may change in the future. We never test any of our products on animals- we test them on our FAMILY & FRIENDS. Lucky them, huh! Q: Do you offer trial sizes or samples? We have over 400 products. Each product is hand made, hand poured and hand labeled. Each product that we sell is a work of art. We do not just pick up the phone and order a product like other companies, so we feel that each product is a gift. Because of this and the overwhelming demand for samples, we are not able to offer them. We need to save all of our time to make our full-sized products. Q: I know your products are toxic-free and gentle; however, do you guarantee that I will not have a reaction from using them? We have many customers who have mild to severe skin conditions and they continue to have success using our products. However, we cannot guarantee that our products will not cause ANY irritation since we are not familiar with each customer's particular case and cannot take responsibility for each reaction a person may encounter. We suggest contacting your doctor if you feel an ingredient in one of our products may irritate your condition. Q: What is the difference between your POOFY ORGANICS products and POOFY Supernaturals products? There are NO differences in the standards for FOOD to be certified USDA organic and personal care products. That means that if an ingredient is not allowed in a food, it is not allowed in a certified organic product. Because some products REQUIRE specific ingredients to be made, and we need to use those ingredients, we have some products that are not certified. POOFY Supernaturals products are a line of products that have a non-certified status. These products will be notated as *not certified to the organic level. 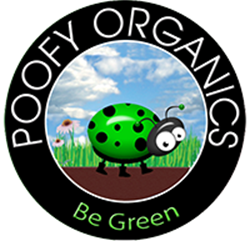 Products with the POOFY ORGANICS logo are USDA Certified Organic. Q: Is a specific product safe to use while pregnant/breastfeeding/ or safe for my infant/toddler/child? Our products are as naturally-based as possible. However, we do use essential oils. There are many schools of thought regarding essential oil safety. Most can be used with no concern; however, we always suggest each family does their own research when it comes to the ingredients and essential oils in each particular product and make a choice based on what they feel comfortable doing with their family. Just as food has possible concerns for reactions, so can personal care products. As ingredients are a very personal choice, we could never make that choice for you. All our products are to be used with caution. Q: Why do different products of the same smell not smell exactly the same? We use a variety of organic ingredients to make our products that are not stripped of their naturally-occurring odors. We feel that the extensive benefits and healing properties of those ingredients are especially helpful in the products. Because of this, the essential oils and extracts that are used to create the smell will act differently depending on the product. Some may be stronger than others. Q: I ordered this product a few months ago and it seems different this time. Why can’t it be exactly the same? Using naturally-based ingredients causes products to vary slightly between batches. A product may be harder, softer or smell vaguely different than the previous batch. Q: I see my product is separating. Is this normal? Why does this occur? Conventional products use toxic chemicals such as anti-freeze (Propylene Glycol) to maintain the liquid integrity of their products. We choose not to use these chemicals and because we are USDA Certified Organic, we are not allowed! If you find your product separating, simply shake it prior to use. We feel the small inconvenience is worth it! Q: How do I add to or modify my order? In an effort to get our shipments to our customers as quickly as possible, orders cannot be modified once placed. Q: Do you use palm oil in your products? We do. USDA Certified Organic ingredients are sometimes difficult to source so we must be open to using all oils. Our Brazil-sourced palm oil is 100% organic and is used in all of our palm-oil products and because orangutans are not native to South America, the Brazilian palm industry does not adversely impact their wellbeing.